Plan your getaway to Pinehurst Inn Bed & Breakfast with our list of recommended things to do in Wisconsin and the Apostle Islands area. Located in northern Wisconsin on the shores of Lake Superior, Bayfield provides a unique mix of beauty, history, and nature. It’s also one of the best places to escape and relax. The options of things to do near our inn are myriad, ranging from active outdoor activities to shopping and museums. Spend your day sightseeing and exploring, then come home to total peace and tranquility at the Pinehurst Inn Bed & Breakfast – one of the top-rated bed and breakfasts in Bayfield. For those looking to explore nature, Bayfield offers miles of scenic hiking trails as well as many opportunities for kayaking. Take a cruise of the Apostle Islands National Lakeshore, take the ferry to Madeline Island, or enjoy shopping at various artisan shops in and around Bayfield. You may also enjoy visiting the local orchards, farms and wineries or bike riding the nearby CAMBA trails. Cap off your day at Lake Superior Big Top Chautauqua where you can listen to fantastic live music in a glorious setting. In the winter, the great outdoors awaits with the miles of cross-country ski and hiking trails, downhill skiing and tubing on Mt. Ashwabay, dogsledding and so much more. The fall colors and Bayfield Applefest are some of the autumn highlights. No matter what the season, Pinehurst Inn Bed & Breakfast and the Bayfield, WI area provides a wonderful backdrop for outdoor enthusiasts and anyone who simply wants to take a break, relax and unwind. WANT TO LEARN MORE? CONTACT THE PINEHURST INN BED & BREAKFAST TODAY! Guest resources for good information about things to do in Bayfield, WI, start here! As innkeepers, we are ready to help you plan your getaway, just give us a call at 715-779-3676. Bayfield Inn (Lakeside Restaurant) 715-779-3363 20 Rittenhouse Avenue. Open 7 days a week for breakfast and lunch. Days and hours for dinner vary depending on the season. Located on the water with windows overlooking Lake Superior. Dinner menu options may include whitefish and trout, steaks, chops, and pasta. Casual to business casual dining for dinner. Note: in the summer, there is a rooftop deck for drinks and casual dining. Copper Trout (formerly Ethel’s) 715-779-0293 250 Rittenhouse Avenue. Open seasonally for dinner. Casual dining. Menu includes sandwiches, pizza, pasta, as well as seafood and steak dinners. Maggie’s 715-779-5641 257 Manypenny Avenue. Open year-round 7 days a week for casual lunch and dinner. An eclectic restaurant with flamingo décor and lots of other trinkets covering the walls—making for an interesting dining experience. Menu options include hamburgers, pizzas, sandwiches, soups, pasta, fish dinners, and of course, Bayfield’s famous whitefish livers. Hours vary depending on the season. ManyPenny Bistro 41 Manypenny Avenue. Serving breakfast, lunch and dinner. Casual dining. Lunch and dinner menu includes pizza, gyros, and sandwiches. Free delivery service offered. Days and hours vary depending on the season. Morty’s Pub 715-779-3996 108 Rittenhouse Avenue. Serving drinks, appetizers and sandwiches. Open seasonally. Hours vary. Old Rittenhouse Landmark Restaurant 715-779-5111 301 Rittenhouse Avenue. Upscale dining for dinner (although no dress code, looking “nice” is preferred). Menu generally includes steaks, chops, chicken and fish, but certain nights are special fixed course dinners, some with wine pairings. Days and hours vary by season. Reservations recommended. Pier Plaza Restaurant and Pickled Herring Bar 715-779-3330 1 Rittenhouse Avenue. Casual dining for lunch and dinner with Lake Superior views. Dinner menu includes soups, salads, sandwiches, and fish. Outdoor seating available in warmer weather. Days and hours vary by season. Portside Restaurant 715-779-5380 34475 Port Superior Rd, Bayfield, WI. Open seasonally for dinner. Casual to business casual dining. Menu includes soup, salad, sandwiches, fish, and pasta. Days and hours vary. The Creamery Bar 715-913-0180 31 South 1st Street. Serving drinks and pizza. Open 7 days a week, hours vary. The Fat Radish 715-779-9700 200 Rittenhouse Avenue. Casual dining. Deli-style lunch. Dinner menu changes depending on the season. Days and hours vary by season. Café Seich 715-747-2033 794 Main St. Farm to Table approach. Open seasonally. Limited days and hours. Farmhouse 715-747-3276 858 Main St. Farm-to-Table approach for breakfast, lunch and dinner. Days and hours vary depending on the season. Pub Restaurant (at the Inn on Madeline Island) 715-747-6315 641 Fort Rd. Days and hours vary depending on the season. The Beach Club 715-747-3955 817 Fort Rd, LaPointe. Bar on the water, offering lunch and dinner. Open 7 days a week. Tom’s Burned Down Café 715-747-6100 234 Middle Rd. Drinks and food available and live music on certain days. Call or check Facebook for hours and live music schedule. Open seasonally. Days and hours vary. Café Coco Artisan Bakery & Good Eats 715-373-2253 146 West Bayfield Street (Hwy 13). Serving breakfast and lunch. Deli-style menu includes soups, salads, sandwiches and bakery items. Open year-round 7 days a week. Hours vary depending on the season. Dalou’s Bistro 715-373-1125 310 West Bayfield St (Hwy 13) (just past the IGA going south on 13) Dinner only. Casual dining. Menu includes wood-fired pizzas, salads, calzones & homemade gelato. Days and hours vary depending on the season. Good Thyme Restaurant 715-373-5255 77180 State Hwy 13. Casual to business casual dining. Located in a beautifully renovated 100 year-old home, this restaurant is known for its steaks and seafood. Reservations encouraged. Days and hours vary depending on the season. Patsy’s Bar & Grill 715-373-5792 328 West Bayfield Street. Open 7 days a week, serving lunch and dinner. Menu includes appetizers, soup, salads, hamburgers and other sandwiches. Hours vary. The Snug Bar 715-373-0338 308 West Bayfield Street. Open Wednesday through Monday, hours vary. Serving appetizers, soup and sandwiches. Outdoor deck available in warmer weather, with live music at various times/days on the deck. Deep Water Grille / The Alley 715-682-4200 808 Main Street West. Open 7 days a week for casual lunch and dinner. Menu includes soups, salads, hamburgers, and sandwiches, as well as seafood, steaks, and pasta dinners. Second Street Bistro 715-682-6444 201 Main Street East. Casual dining, serving lunch and dinner. Menus include soup, salads and sandwiches, gnocchi and pasta dinners as well as whitefish, steaks and chops. Days and hours vary depending on the season. Have an Adventure in the Great Outdoors! There are so many amazing adventures to be had in Northern Wisconsin. Take a look at some of the best options for outdoor recreation in and around Bayfield to start planning an unforgettable experience. The Madeline Island Ferry is located on the south shore of Lake Superior at the gateway to the Apostle Islands and offers daily passenger, bicycle, and car transportation between LaPointe and Bayfield. 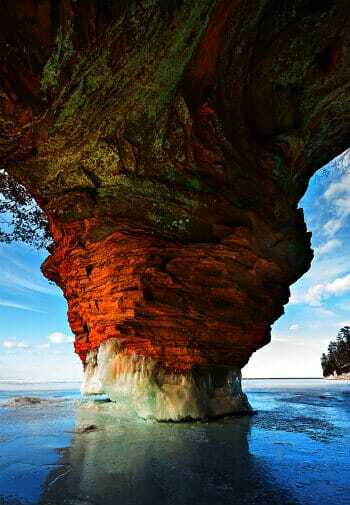 The trip lasts about 25 minutes and provides scenic views of Lake Superior and some of the 22 Apostle Islands, including the beautiful Madeline Island. Read our blog for a list of the best things to do in Madeline Island, WI. A full or half day kayaking adventure with Lost Creek Adventure will take you out to the Mainland Sea Caves located along the mainland shoreline, part of the Apostle Island National Lakeshore. These amazing sandstone caves have formed over centuries of wave action, freezing, and thawing – nature’s way of artful carving. The full day trip includes all equipment, basic training, a knowledgeable guide, a picnic lunch, and lots of laughs. Lost Creek Adventures also has stand up paddle board tours, another great way to experience Lake Superior. 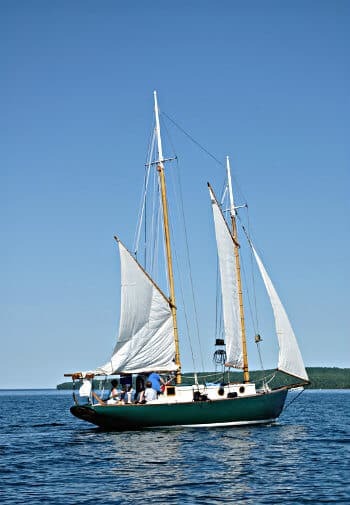 Get on the water and enjoy a 2 1/4 hour Afternoon Sail offered by Dreamcatcher Sailing, which departs out of Bayfield, WI every afternoon. Explore the beauty of Bayfield from the water, Madeline Island and beyond. Take the helm under the guidance of the boat’s captain or sit back and relax, enjoying a magnificently relaxing experience. This is just one of many trips offered by Dreamcatcher Sailing. Winter in the Bayfield Peninsula can be magical. Throw in a dog sledding adventure along with winter lodging at Pinehurst Inn Bed & Breakfast (think sauna, fireplace, whirlpool….) and you are good to go! Enjoy the Wolfsong Morning Adventure, a 4-hour dog sledding trek. You will learn from the best in handling, harnessing and running the dog through absolutely beautiful winter terrain. Bayfield is well-known for their annual festivals and events that highlight the area’s colorful culture and welcoming community. Here are a few of the best annual events to attend while you’re here! This month-long celebration of spring draws both visitors and locals alike. You’re bound to be inspired when you attend the many activities of Bayfield in Bloom, such as garden tours, demonstrations, and other interactive programs related to gardening. Celebrate the arrival of autumn when you attend the Bayfield Apple Festival! This beloved tradition offers food, games, vendors, and much more. Winter is a beautiful season in Wisconsin! The Bayfield Winter Festival encourages visitors and locals alike to enjoy this winter wonderland through skiing, live music, food, candlelight walks, and even a polar plunge! Explore the area’s fascinating history by visiting one of these museums in Northern Wisconsin! Each one has something unique to offer, so don’t miss out. This institution has a little of everything! Visit the Northern Great Lakes Visitor Center for entertaining events, outdoor recreation, and intriguing exhibits. Learn the history of Madeline Island and its people through the Museum’s permanent collection of artifacts and special exhibits highlighting the people and culture, which made Madeline Island what it is today. The nearby Lake Superior is filled with gorgeous, historic lighthouses that each tell a story about this area’s history. Visit some of these Lake Superior lighthouses for a memorable day around Bayfield, WI. Bayfield, Wisconsin, has an incredible history. If you want to learn all about this area’s origins and culture, visit the Bayfield Heritage Museum to hear the stories of this charming city on the banks of Lake Superior. Some of our other favorite orchards include Blue Vista Farm, Bayfield Apple Company, and Sunset Valley Orchards. Candy Shoppe in Bayfield – we love their ice cream! Sweet Sailing in Bayfield – don’t forget the fudge and saltwater taffy!! !